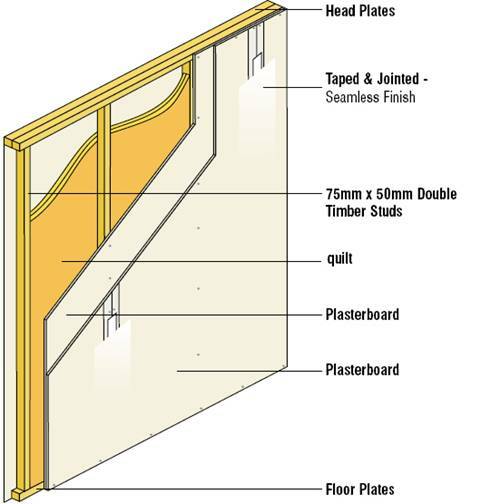 How to soundproof a double stud separating wall to meet Part E of the Building Regulations for constructing soundproofed double stud walls with our acoustic plasterboard and SoundBlocker Quilt. The best solution when constructing lightweight party walls that are properly soundproofed against normal everyday noise from neighbours. SoundBlocker Quilt SBQ2 is produced using 25mm mineral wool on either side of 5Kg/m2 SoundBlocker Membrane. This combination gives the product enhanced sound absorbing and sound blocking performance and far better than any other normal mineral wool alternatives creating a far better, soundproofed partition wall. 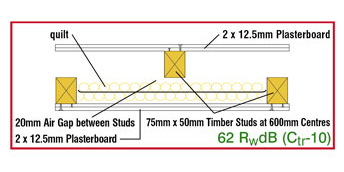 Because it is up to 4 times more efficient than normal cavity infills due to its unique sound barrier layer sandwiched within the product a superior, soundproofed stud wall can be constructed. Using this SoundBlocker Quilt system will exceed the requirements of the Part E Resistance to the Passage of Sound document making it the sensible choice for both new build stud walls and conversion of existing walls in flats. 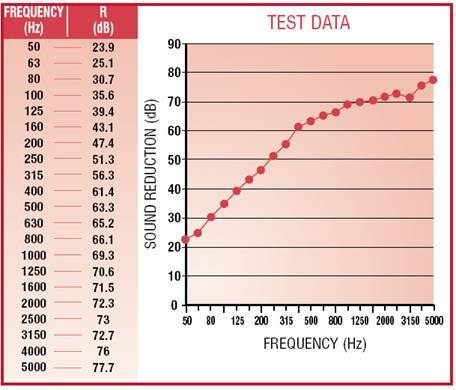 SoundBlocker Quilt can up rate a normal partition by up to 16dB! Sound Service (Oxford) Ltd, Crawley Mill, Dry Lane, Witney, Oxfordshire. OX29 9TJ.